The Addams Family is one of my favourite Halloween movies that I HAVE to watch every Halloween season.. so what would've been a better than to do that for my submission!! 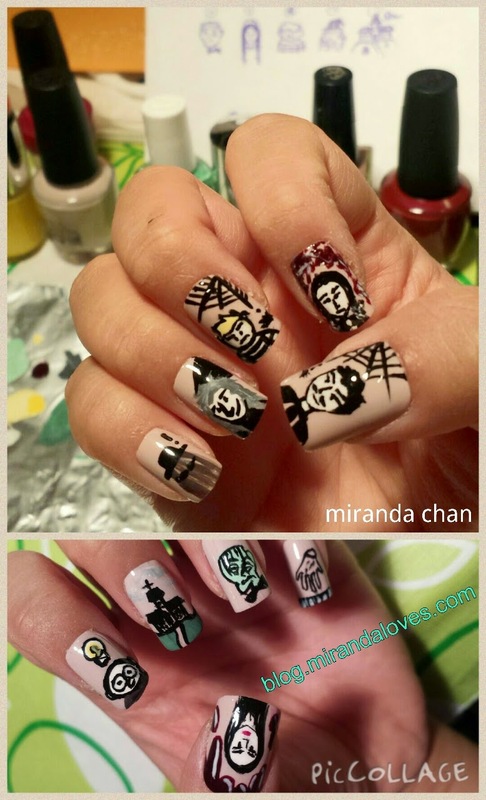 http://www.nailpolishcanada.com/halloween-nail-art-challenge/ I am no.19 - under Miranda Loves : The Addams Family Value Manicure. If you don't see my blog name in the drop down, please manually type it in with blog.mirandaloves.com ... Thank You So Much!! I'm thinking of doing more fake nails, tailoring them and giving them to my interested friends/doing a blogger sale for Halloween or any upcoming holiday season.. what do you guys think? Thanks Everyone! The contest closes October 25th, 2014! How this is so impressive! I can't believe you freehanded all of that! My favourite is the house. So. Much. Detail! I voted, hope you win!